In his ministry, Jesus showed striking interest in and love for children. To the surprise of his disciples, he often including them in his teaching: “Then children were brought to him that he might lay his hands on them and pray. The disciples rebuked the people, but Jesus said, ‘Let the little children come to me and do not hinder them, for to such belongs the kingdom of heaven’” (Matt 19:13–14). When the disciples came to Jesus asking him which one of them was going to be the greatest in Christ’s kingdom, Jesus called a child to himself (Matt. 18:2) and said, “whoever humbles himself like this child is the greatest in the kingdom of heaven” (Matt 18:4). Jesus went on, telling his followers that part of their duty is to receive little children: “Whoever receives one such child in my name receives me” (Matt. 18:5). In Mark 10, Jesus upholds childlike faith as admirable: “Truly, I say to you, whoever does not receive the kingdom of God like a child shall not enter it” (Mark 10:15; cf. Luke 18:17). Jesus wants his followers to honor, protect, and care for those among them who are small and vulnerable, especially children. Part of Jesus’ ministry on earth involved healing children. In Mark 5:39, Jesus came into the house of a ruler of the synagogue, whose daughter had just died. Jesus said that she was not dead, but only sleeping. After they laughed at him, Jesus said to the child, “Little girl, I say to you, arise” (Mark 5:41; cf. Luke 8:54). Mark recounts what happened next: “And immediately the girl got up and began walking (for she was twelve years of age), and they were immediately overcome with amazement” (Mark 5:42). Similarly, in Mark 9, Jesus encounters a young boy who had been having demonic attacks. Jesus commanded the unclean spirit to come out of him (Mark 9:25) and the boy fell down as if he were dead. Jesus took him by the hand and he was healed (Mark 9:27). Jesus, who calls himself “the resurrection and the life” (John 11:25), brings life and healing to children. Jesus’ love, honor, and care for children leads us to imitate his care for children and take action to protect them from those who try to harm them. 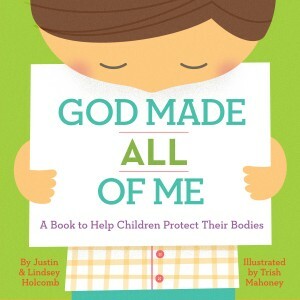 Pre-order our children’s book: God Made All of Me: A Book to Help Children Protect Their Bodies.